This trek was pretty much an unexpected one. Had got a weekend off from college thanks to Deepavali and with continuous holidays we planned for at least a 2 day trek. A bit of googling and the destination was decided to be "Mullayangiri to Bababudangiri" trek on day 1 and trek to Kalhattigiri/Jenukal falls the next day. In short we were having 2 single day treks :). Total headcount was just 5 (Vineeth, Shashi, Jenny, Manju and Myself) and we had rented a sumo (since there is very sparse public transportation available near our trek region) with a psycho driver behind the wheels. Everyone was picked from respective stops and we were on our way to Chikmagalur at around 11.30 pm. Night matured and people started to feel drowsy, so much so that all the occupants of the cab were sleeping including the driver :P. Initially we suspected that he was snoozing behind the wheels , but it was confirmed for sure when he banged the sumo to a divider, well at least sideways, waking up all of us with a bang , and with a jolt where I felt I was really done for :P. After this we ordered the driver to sleep if he is feeling too drowsy. And by then I had decided that this is the last time we will be hiring a taxi to travel during a overnight journey. Overall we had an uncomfortable sleep , thanks to the hopeless seats of the sumo and driver playing 5 -6 kannada haunted songs on infinite loop till the morning. Dont know whether that helped him in any way or not, but we surely had a "Halloween Sleep":P.
Reached Chikmagalur, had our breakfast and packed our lunch. 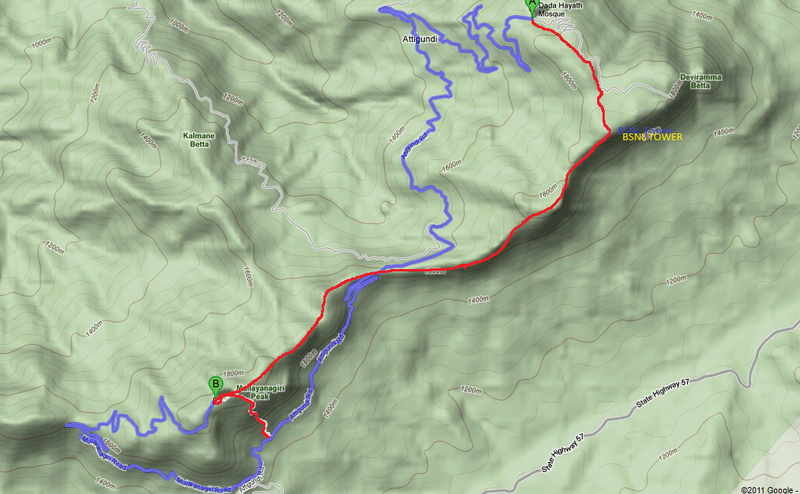 It was time to go in search of the starting point of the trek to Mullayangiri , ie Sarpadhari. Started from the Sarpadhari arch at around 8 am in the morning and at this time of the day the entire path was filled with mist. So we were void of any views , but trekking in mist offers a different type of enjoyment. Within an hour an half we reached the famed caves of Mullayangiri, which is just 10 mins walk from the peak. There were basically 2 caves and we decided to explore one of them which seemed to run into great distance. But being a little claustrophobic, I was little hesitant in the beginning , but couldn't resist the opportunity of missing an adventure. So off we went inside the cave system , armed with flashlights and nothing else. With me crawling up first, my first job was to check the ground for any sort of reptiles which might have crawled into this for shelter and later the roof for any sign of bats, and to my utter amazement there were a lot of bats in this cave system. Initially we were scared of the bats that they might attack us, but later we came to know that these are really misunderstood creatures. We crawled for some 60-70 meters deep into the cave and still the end was not in sight. At one point we switched off our lights and there was absolute darkness, unlike anything I have experienced, not a single ray of light seeping in. Not sure how long this tunnel goes, but we decided to return back since we had a long trek ahead. Went up to the peak, where there is a temple and also a motorable road which comes directly till the peak. We were now at the highest point in Karnataka at 1930 m. Rested a bit at the peak and started to move towards Bababudangiri after taking route advice from the priest. Now the entire path till the Bababudangiri was walking along a mountain ridge, hence a lot of ups and downs along the ridge. Soon enough the mist/cloud cleared and we were getting some beautiful vistas. Greenery everywhere and drops on the either sides. The initial part of ridge walking was not that difficult at all and soon enough we reached a point where we had to cross a road and continue along the ridge. Now this part of the ridge was narrow, had nearly 300 foot drops on either sides and had some scare quotient. At some places the walk was a bit challenging and hence this was not exactly beginners cup of tea. Soon we reached the BSNL tower after enduring sun,rain, mist and some breathtaking views. Beside the tower was a cozy lake where we rested for some time. From here Bababudangiri was 2 kms and at around 3:45 pm we reached the place. Had some junk food at the local shops, got some firewood from this place to cook our dinner and by 5 pm we were moving towards Galikere, our camping spot (4 kms motorable road from Bababudangiri). When we left Bababudangiri it was a bright day with very few clouds and at the end of our 4km ride to Galikere the entire sky was covered with rainclouds and it had started to rain. Freaky Nature !!!!!! . By the time we collected all our belongings and walked the last 100 m towards the lake we were literally in middle of a thunderstorm. Wind blowing at nearly 50-60 kmph and having no other option we took shelter inside a concrete structure, built quiet near to the lake. Seeing the intensity of the rain we decided to pitch the tents inside the shelter which can accommodate only one tent and hence we ended up with 5 people inside a 3 man tent. Anyway with such a wind gust we still decided to start a bonfire to cook our food, thanks to some amount of petrol we had. But I did a really dumb thing, pouring petrol directly on a open flame and within no time the flames were burning on the mouth of the petrol can , just seconds away from becoming a full blown petrol bomb. I don't know what possessed me, but instead of throwing it away as far as possible I started to blow at the flame trying to extinguish it !!!!!!!!!!!! :P. Thankfully that worked :D. After that have lot of respect for petrol :P. After several attempts to start the fire we gave up and resorted to eating cold bread and jam. Spent some time playing dumb-charades inside the tent when the storm was lashing outside. Visibility was less than couple of meters with no one venturing outside that. Within no time our tent was wet and water was seeping through. We could have only imagined what would have happened to us if there was no shelter :). By morning the rain had subsized a bit. But still the entire place was engulfed in mist and it was freezing like hell. We packed our stuff and waited for our taxi who by the way had decided to bunk for the night in Bababudangiri. He arrived and after some scary hair raising moments managed to reverse the taxi. We went directly to Kalhatti falls , with a tea break in Bababudangiri and breakfast at Kalhatti falls. The destination for today was kalhattigiri/jenukal falls which is around 5 kms walk from the similiarly named kalhatti falls. Took some tips from a local on the route but resisted hiring a guide, to increase our adventure quotient. Initial path of the trek goes through the coffee plantations and gradient gradually rises. There were a lot of crossroads and we literally took a pick among those randomly. We climbed and we climbed. After climbing for some 2 hrs we came to a point where we were in an adjacent hill to the falls, but we were unable to switch between the hills since the path was near impossible. With the path towards the falls having 1/2 foot of bog and it was a tough task climbing on this slippery substance. Now we knew for sure that we were lost and there was no option than returning back. Returned back to a crossroad and took the proper turn and now were in direct view of falls, but minus an hours climb. Anyway we gave up the idea of going further upstream, but still the view of this literally unknown falls from this spot was majestic. Had a half an hour dip in the mini waterfalls downstream of the main falls and returned back to the parking lot at around 3 pm, alighted with our taxi and started the return journey back to Bangalore. Reached Blore at around 9:15pm and reached home at around 10.45pm. Overall in my opinion this was a very unique trek , with caving, ridge walking,water falls exploring etc thrown into a gravy named trekking. A change which I require at regular intervals, like regular adrenaline shots into my blood stream :). Difficulty Level ---> Between Easy and Intermediate (Some sections of ridge walking requires experience). Good Info. If possible upload proper walk path. Beautiful places. Superb pictures too. Lovely place. Good idea to create that silhouette of the person in the cave. Would it be safe to visit this place sometime around this july? Also, Can you tell me about where we can stay there? We are 5-6 in number. Are there any stay options @ Mullayangari peak? We are planning to drive from Bangalore this weekend and will only be able to reach chikmagalur by 1AM Saturday and thinking if we can go directly to Mullayangari and stay there, it would save a lot of time in the morning to start Bababudabgari trek. Which is the best place to pitch a tent in mullayanagiri. Is it safe? Do we need to take permission? Things To Do Before I Go Kaput !!!!!! !